I LOVE these chairs mixed with traditional pieces! I have a pair that I snagged on Overstock in my office! Thanks for the gorgeous inspiration! I love all the mixing going on here. It creates such perfect balance. I love this room. I also have a white lacquer dining table-- obsessed! wow....this is a perfect room! Donna, Adore the gray and the antique chandelier mixed with the modern pieces! So good. I love white and gray together. Lovely! Wow, this room refuses to be defined. Very intriguing! Fabulous!! So glad I found your blog! Lovely space, but that chandy is the icing on the cake. So beautiful. 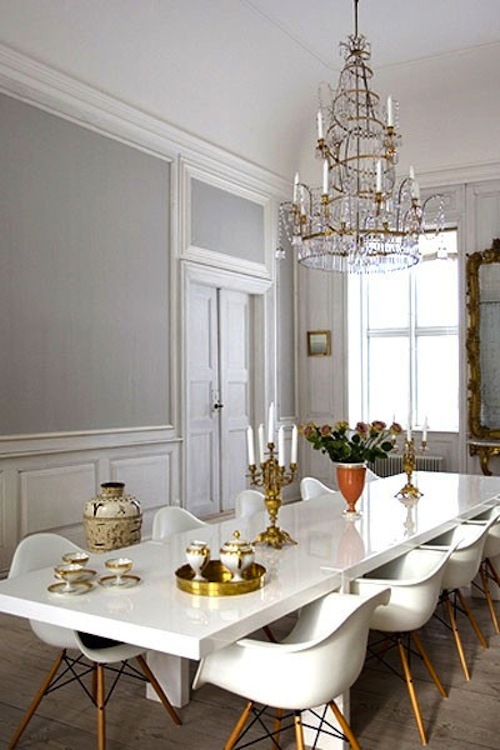 It is a perfect gray and that chandelier is to die for! i want to pick a fave feature from this room, but i just can't! so well put together. I love this fabulous room. What a great eclectic mix!! love the grey, any idea who it's by? I always love the juxtaposition of modern furnishings in traditional spaces!! This image is gorgeous and is going straight into my inspiration files.